UFW Stories: "We are America!" I decided to post date this story September 2007. The concept is similar to opening a time capsule several years into the future. 5 years ago the 2007 Citrus Freeze struck the State of California triggering a state of emergency for many of our counties. The majority of these counties were later declared federal disaster zones by the president. Thousands of farm workers were displaced and unemployed in lieu of the 07 Citrus Freeze. It is important to highlight that our farm workers help feed America on a daily basis, but unfortunately when our farm workers were in need of emergency relief they were forgotten! The good news is that our farm workers know how to organize and have their voice heard. When the 2007 Citrus Freeze took place, the United Farm Workers (UFW) Foundation immediately took the lead, while working collectively in partnership with the UFW and other movement offices (LUPE), including Radio Campesina in California and Arizona. In a collective effort we created and organized an emergency relief plan to assist the thousands of farm workers that were in need of immediate resources such as food, rental, mortgage and utility assistance. Even though the state infused emergency funds to assist with initial relief efforts it was not enough to cover and protect the needs of numerous unemployed farm workers (including the needs of their families). As initial resources depleted rapidly, we started a campaign to advocate for a federal emergency declaration as well as additional emergency funds (ie., a federal emergency declaration for an area or region is needed to activate FEMA resources). It took the president and elected members more than a month to get the ball rolling in relation to providing government relief for our farm workers. In my opinion, our farm workers should have been TOP priority on everyone’s agenda in our national Capitol. Agriculture products are the top exports for California, and in some cases for the nation (U.S.). Our farm workers help infuse millions of dollars annually back into our local, state and national economies. Note, during the Freeze we knew of farm workers that had sons and daughters fighting for our nation in the Middle East. In an idealistic scenario, farm workers and working families should not have had to organize vigils and ‘sit-ins’ inside congressional and U.S. Senate offices, including the CA Governors office in downtown Fresno and Visalia to advocate for relief. Especially when you consider that our farm workers had given their sons and daughters to protect the national interests of the U.S. The bottom line we needed to voice and advocate for relief. The end result = our farm workers were victorious in securing federal emergency relief. Si Se Puede! You would think the story ends here with FEMA saving the world. Unfortunately, undocumented farm workers do not qualify for FEMA resources. However, the private donations that we received did help us reach large numbers of farm workers in need of relief. Another issue that we encountered was the fact that each county is controlled by internal politics, and political preferences. One would assume that in a time of crises one would set politics aside in the best of interest of helping those in need. Not in this case. Let’s just say in simple terms, there is something wrong with the picture when the Fresno Food Shelter was helping us with food relief resources, while our local food center in Tulare County shut us out of the process completely. Note, Ground Zero was Porterville, CA considered ‘the Citrus Belt’ in Tulare County, 75 miles away from Fresno. We were pleased to rent a U Haul truck to pick up the food in Fresno and transport it back to Porterville, CA. When we did organize relief efforts in Fresno County we had no problems working with the Fresno Food Shelter. As mentioned previously private donations allowed us to rent transportation vehicles to move and deliver emergency food resources to impacted communities throughout 3 counties in the Central Valley. An emergency relief effort has many unprecedented situations to over simply the matter / our effort. Thank God for the UFW Foundation, UFW and of the movement offices for providing adequate emergency relief to the thousand of farm workers affected by the freeze. Thank you sponsors and donors that contributed to the 2007 relief effort; (including the CAL ENDOW), we couldn’t have done it without the private donations! Radio Campesino Mil Gracias! I am writing to update you on the first six months of the Freeze Relief program. I would briefly like to summarize some of those achievements in this letter. The UFW Foundation’s disaster relief program in Tulare/Fresno County evolved into a program that focused on disaster relief, immigration reform, and labor rights (heat regulations and prevention of heat stress). The UFW Foundation organized and established a presence in 8 farm working communities within Tulare County. We reached and informed an estimated 2,739 farm workers with our door to door program. Advocacy efforts were essential in fighting for proper disaster relief from government agencies. The UFW Foundation collected over 1,000 farm worker letters to declare federal disaster zones and coordinated vigils in six congressional offices (including the CA Governors Office). This took place for a period of time of three weeks. After the 1st day of vigils, Senators Boxer, Feinstein and the Governor sent a joint letter to President requesting immediate action. Our strategy worked! Advocacy efforts, included mobilization of 20 – 50 farm workers and student volunteers to legislative offices on a daily offices. In addition, farm workers made presentations before their local government (city councils) asking to support an emergency relief resolution. We collected approximately 12 resolutions in support from different cities within the surrounding region. In brief, federal disaster zones were officially declared after 10 days of advocacy. Since February, we have coordinated over 15 food distributions, serving an estimated 10,000 farm workers (includes farm working families). An average food distribution consists of 500 – 1,500 workers (depending on the community). Approximately 8,296 surveys have been collected and inputted in our database (door to door program). This survey has 20 indicators that track rental/ mortgage payment, utility payments, local government assistance, type of work, length of time residing in apartment/ residence, email, contact information, affected family members, and company name. The UFW Foundation also worked in collaboration with other agencies. We assisted (Comision Honorifica) with small scale distribution of emergency food (150 farm workers every Friday). In addition, we assisted Catholic Charities in promoting their rental/mortgage assistance program. We’ve referred approximately 200 farm workers to Catholic Charity District Offices in Farmersville and Visalia. We also participated as a partner in the (Tulare County Freeze Task Force), coordinated various meetings with (United Way Tulare County), as well as with (Tulare County Food Link) with a goal of planning emergency relief efforts. We also assisted EDD in disseminating outreach materials (DUA) to affected farm workers. On a weekly basis we partnered with Radio Campesina to conduct outreach activities & events. We utilized this opportunity to set up an informational table at their events to distribute literature relating to freeze relief, heat stress and immigration reform. 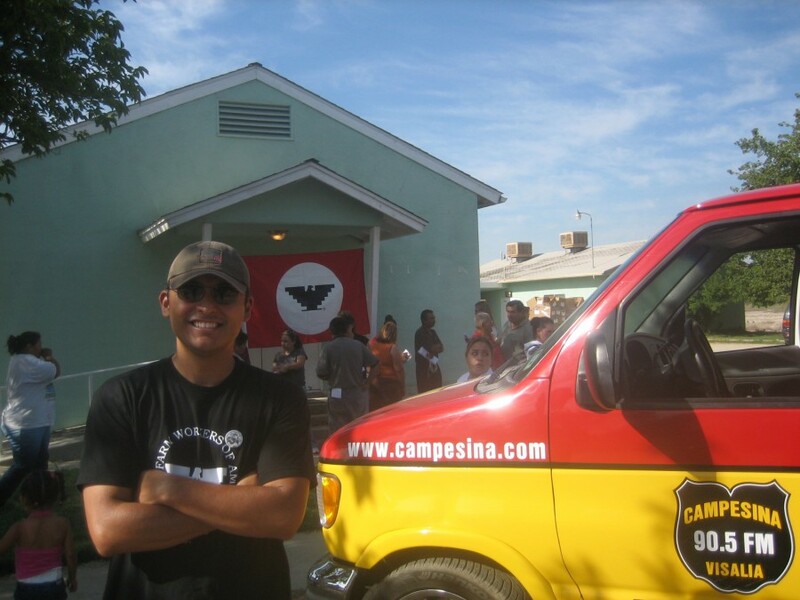 Through Radio Campesina we were able to establish a strategic partnership with Sequoia Distributors to utilize their semi-trucks as a method to transport UFW Foundation emergency food supplies to impacted farm working communities. In addition, we established a partnership with Fresno Univision. They were outstanding in covering and running a story in relation to freeze relief at least once a week. Farm workers have been excited over the possibility of a legalization program. We organized a town hall on this issue with approximately two hundred people in attendance. The UFW Foundation organized a coalition of partners (CRLA, Univision Fresno, Radio Campesina) to help identify problems centered around heat stress violations. The Heat Stress Coalition identified approximately 70 companies that are/were violating a (CAL OSHA) Heat Stress regulation. Also, the coalition collected 422 CAL OSHA complaint forms from individual farm workers, affecting an estimated 9,266 farm workers. The UFW Foundation alone collected over 168 CAL OSHA complaint forms, affecting an estimated 5,522. The Foundation used its traditional outreach methods to inform farm workers. In summary, our Freeze Relief Program is working closely with farm workers, community organizations, and government agencies to effectively inform, reach, and improve the lives of America’s farm workers. Citrus workers will return to work next month, but much work remains to be done. AG JOBS still has an opportunity to pass this year, labor violations continue in the fields and need to be monitored and checked, and farm workers are still suffering from the financial consequences of lost work. Once again, we would like to thank you for helping the United Farm Workers Foundation.